So, I’ve decided to make a little challenge for myself and do a Stamp Trio Challenge. I will take a specific stamp set and create 3 cards with it, and I’ll try to push myself to make very different cards (ex. masculine, feminine and general, or different themes/sentiments). I think this is such a great idea and I wanted to play along. 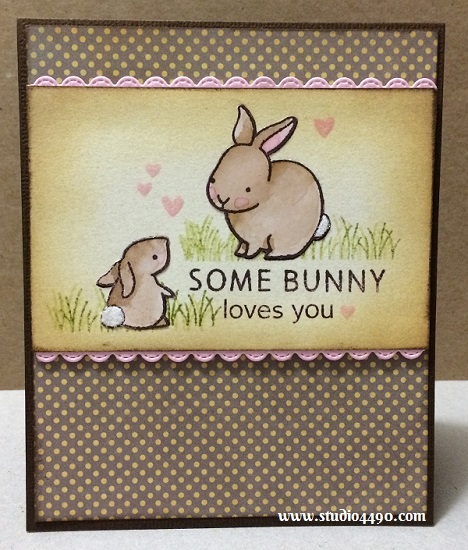 Elle started her challenge with the Hello Baby stamp set from Lawn Fawn. Since I have just purchased this same set I thought I might as well start the challenge using this set. Materials used: Stamps – Critters on the Savanna, Hello Baby (Lawn Fawn), A Little Sentimental (Clearly Besotted); Dies – Stitched Scalloped Borders (Lawn Fawn); Designer Paper – 6×6 Patterned Paper Pad – Serenade (Basic Gray); Cardstock – American Crafts, Unknown; Distress Ink; Distress Markers; Glitter – White (Wow); and Wink of Stella. So this is my first card in the Stamp Trio Challenge. Now I’m off to make card number two. Thanks Elle for creating such a great challenge! If you play along, please link to your card in the comments as I would love to see what you make. And please visit Elle’s blog – you are in for a real treat! lol I could just go into the gift card set industry? haha Such a good idea actually. I make way more cards than I ever use/send. It’s such a great challenge, C, you should play along. Thank you for your enthusiasm. You are such a great friend! hugs!